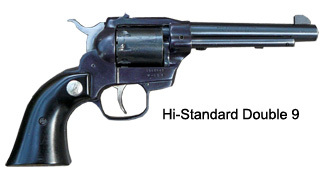 In my previous post “Fifty Years of Plinkin’ I mentioned that I had recently purchased a .22 caliber Ruger Single 10 revolver in memory of the Hi-Standard Double 9 revolver I had in my youth. My friend and business partner, Jerry Colliver, knowing I would love to have a Double 9 again, found one for me. And boy was it a find. The gun is in practically new condition and still in its original box with a price sticker on it from 1968 from Bud and Jim’s Sporting Goods. The price was $64.98. I paid a little more than that for this excellent Double 9, but have no regrets. It came with three sets of grips: staghorn, pearl and black. Although my previous Double 9 had the staghorn grips on it, I like the black ones better, so put them on this gun. One day last week during my lunch hour I took the two guns shooting — the Double 9 and the Single 10. I had some .22 Long Rifle cartridges and some sub-sonic .22 shorts. I shot a box of the Long Rifles in each gun and about 30 of the .22 shorts in each gun. Accuracy was about the same for either gun. Shooting the shorts was a hoot because the sort of make a “psst” sound rather than a bang. The Double 9 has cool feature that I didn’t remember from my previous gun. When shooting it in the double-action mode, you can just pull the trigger all the way back, but if you’re squeezing it like we’ve all been taught to do, you’ll feel a definite stopping point just as the hammer reaches it’s full-back position. You can actually pause there and realign your sights before continuing the trigger pull through until the gun fires. With a little practice, you can stop at this point every time. It’s sort of like having the inherent accuracy of a cocked single-action built into a double-action gun. There is no question the Ruger is built better. The Double 9 has an aluminum frame while the Beretta is all steel. But with reasonable care, I believe this Double 9 will provide me a lot of plinkin’ fun during the rest of my life and will still be around for the grandkids to enjoy. Thank you, Jerry! Like seeing an old friend you haven’t seen in years and one day you meet again and find out you each live right around the corner from each other now. 1968 was a good year. Wow 44 is a double number and if added and rounded is 9.0. Next Next post: I I Thought I Could Decide, But . . .